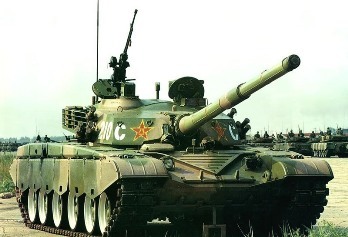 In addition to the type Type 90 Tank, China develop the most advanced Tank Type 99.
collaborate with Russia. Tank Type 90 125 mm caliber gun equipped and suitable for use with a missile, known as reflex 9K119 pembuhun heavyweight tank. This tank has a cruising range of 600 km, with an additional tank. The maximum speed of 60 km / h on the road off-road and 80 km on the highway. Simply drag to the size of the tank weight class. Tank Type 90 has the protection of 1000-1200 mm. Thick enough to withstand the onslaught of tanks in the battle between heavyweights. He weighs 54 tons and 4 crew operated.